The “Blue Heron” is a 26’ Dusky Center Console, with a deep hull to provide comfort & stability on the waterways. 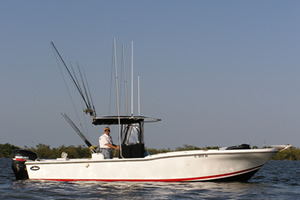 The “Blue Heron” is professionally equipped and staffed for fishing the near-shore and in-shore waters of the Space Coast. She is Coast Guard safety equipped and we provide Star Rods and Penn Reels for fishing. The “Blue Heron is also roomy – great for the nature/eco tours as well. Also on board there is a live well and downriggers. Other amenities provided are enclosed toilet, and a spray, rain and sun shield for protection from the weather, and a new, quiet, smoke free engine. We also provide bottled water, soft drinks and an ice cooler on all our tours.